Just one Cornettoooo, give it to meeee! Is what I imagine fans have been singing outside Edgar Wright’s door for the last six years, demanding the final chapter of the Cornetto trilogy. God, has it been that long? We had a mere three years between Shaun of the Dead (2004) and Hot Fuzz (2007), yet it’s been twice that wait for the final instalment. Was it worth it? Largely…yes. I consider that a definitive answer. More than my usual balanced, sitting-on-the-fence reviews anyway. I’ll explain why but first, a quick run down of the plot. 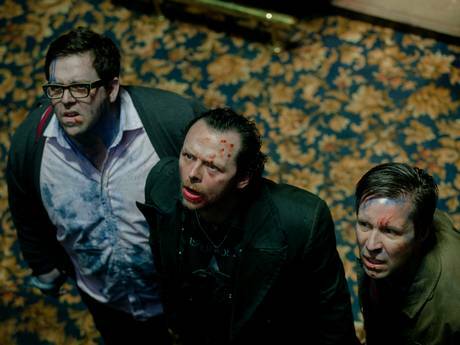 Now, for those not in-the-know, me referring to The World’s End as the final of a trilogy can be somewhat confusing. Maybe unofficial trilogy is more accurate. 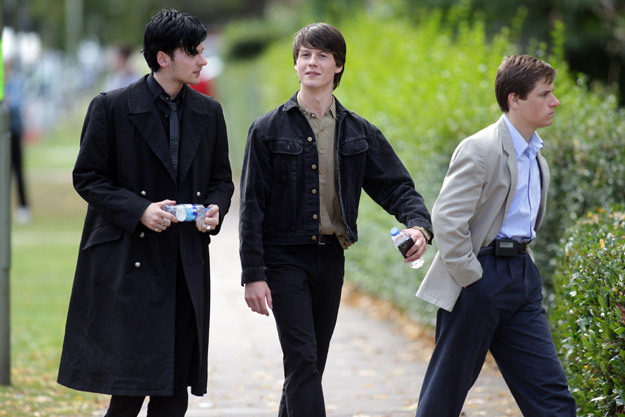 Essentially, in-jokes, small telling references and the core team of Simon Pegg, Edgar Wright and Nick Frost. Plus the very British tone and setting of each film. Oh – and actual Cornettos. Other than that, you’ve got a zombie comedy (Shaun essentially coined the term ‘zom-com’), a playful poke at ’80s action buddy cop movies, and now a sort of warped, apocalyptic, alien sci-fi. It all begins with Garry King (Pegg) at an AA meeting, recounting the best night of his life; a pub crawl round his home town during his teens with childhood pals. 12 pubs, 12 pints. However, they never finish the crawl. A plan forms. Reunite the old gang and finish what they started. The crawl begins innocently enough, however they quickly realise the sleepy town is not what it once was, having quite possibly been taken over by aliens…or robots. They can’t quite decide as they’re drunk. The issue I have is I’m guilty of comparing this to their past work. Ultimately you should judge a film on its own merits. It should stand on its own two feet. Unless of course, it is part of a true trilogy. As this isn’t I feel slightly torn comparing it to Shaun and Hot Fuzz. The former a comedy classic, the latter not far behind and improving with every viewing. This outing is a familiar, yet noticeably different beast. If you were to judge this as the final part of a trilogy, I’d say you can see clear progression. Shaun felt like a youthful, exuberant romp with zombies as a backdrop. Hot Fuzz offered a little more of the same, yet felt a shade more developed in terms of storytelling, comedy and action set pieces. The natural, easy chemistry between Pegg and Frost has also grown. 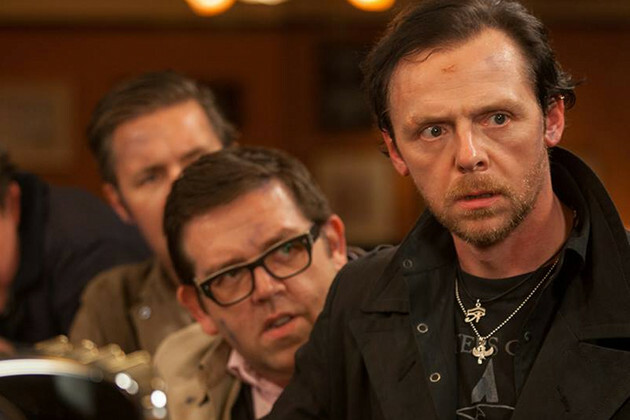 The World’s End feels like the natural conclusion – easily the most grown up of the three. A comedy, but with more to say and more complex yet subtle ways of saying it. That’s not to say it’s not free flowing and a barrel of laughs. 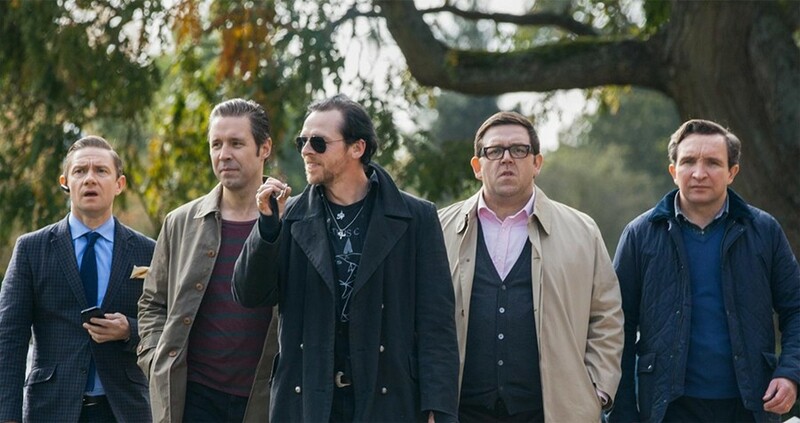 Pegg and Frost – in some ways – feel like they picked up where they left off in Hot Fuzz and, whilst (sort of) new additions (Martin Freeman, Paddy Considine, Eddie Marsan and Rosamund Pike) all get some juicy lines to sink their teeth into, it is and always will be the Pegg and Frost show – and we wouldn’t want it any other way. Whatever happened to Christian Slater?